Can mosquito species tell each other apart? This is Sandra Tsing Loh with the Loh Down on Science, saying: Well, not really. 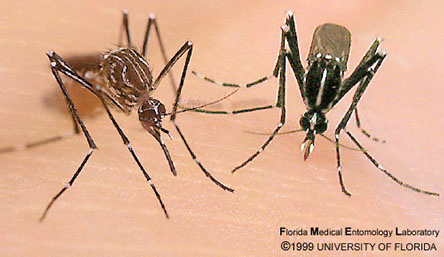 That’s why yellow fever mosquitoes will try to mate with Asian tiger mosquitoes, and vice versa. Enter University of Florida entomologists. They wondered about yellow fever mosquito populations declining. It only happened when the Asian tiger species was present. The entomologists suspected “satyrization.” [say-tur-ih-zay-shun] That’s where different species mate, but usually no offspring result because the genes are too different. It’s an evolutionary device for one species to crowd out another. In this case though, after being with Asian tiger males, yellow fever females seemed oddly disinterested in mating with their own guys. To find out why, the researchers placed yellow fever females with Asian tiger males. Later, they examined the females’ reproductive tracts. They found no sperm—only seminal fluid. Strange! Next, they placed them with yellow fever males. Far fewer mated and produced offspring than expected. Conclusion? Asian tiger seminal fluid somehow suppresses yellow fever females’ instinct to mate. That’s strong ju-ju! Sorry, yellow fever males. Nothing takes the sting out of that!